Addition Math Games Are Great Fun For Kids And Big Help For Teachers. Make learning to add lots of fun with addition math games. It's a lot easier to keep kids interested when they're having fun. I think you'll like using these fun addition squares with your students. Plus they're pretty easy to make them up yourself. Of course we've got some made ready for you to print. 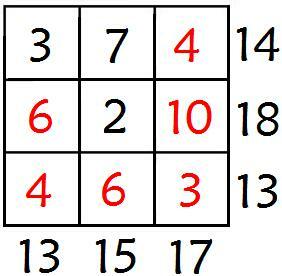 Notice the three numbers in each row add up to the number on the outside of that row. Same goes for the three columns. Take a look at the one above - it's already solved. The numbers in red are what the student would have to fill in to solve this one. Notice the three numbers in each row add up to the number on the outside of that row. Same goes for the three columns. Kids seem to really enjoy them because it's sort of like a math puzzle. Of course, they are using their math skills as they solve the addition squares. * Have a contest to see which student or team can complete the most addition math squares in a certain time. * Have students work on squares individually to practice the addition facts they need to work on. If you enjoyed this addition math squares, here are some games using addition your kids should also like. Dr. Moon Rocket Addition: Here's a fun online math addition game that makes learning addition facts fun. Try to finish all the levels and then see Dr. Moon's Rocket Blast off! Addition Regrouping Game: Here is a hands-on addition game for two students. Just need two dice, pencil, and paper for each pair of students. Addition math games and activities should be a regular part of a child's math learning experience. Even though worksheets and addition homework are needed, kids are really love playing games. "Yep", even us adults love games too. So it's a win-win for everyone...they are having fun and learning math at the same time! Have you tried the printable addition games?